How Authentic Is Your Thanksgiving? Elin Meliska is the Program Coordinator for the Test Kitchen in the National Geographic Museum’s new exhibit, “FOOD: Our Global Kitchen”. She was a Math teacher in Chicago Public Schools before switching over to the world of museum education. Elin’s current work focuses on how food can be used as a mechanism to deliver content in all different subject areas. FOOD: Our Global Kitchen explores the complex and intricate system that brings what we eat from farm to fork. 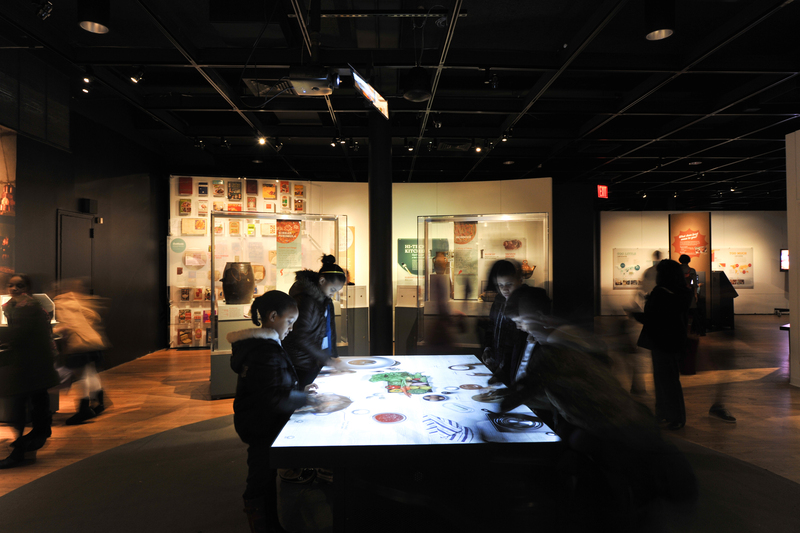 In sections devoted to growing, transporting, cooking, eating, tasting, and celebrating, the exhibition illuminates how our world eats and the future of food. Food: Our Global Kitchen is at the National Geographic Museum until February 22, 2015. I love starting lessons by immediately creating a connection to students’ lives. By investing students right away, they are quickly able to see how the topic relates to them and begin to build a deeper connection to the topic. In this instance I started out with the student’s own Thanksgiving meal. For Teachers: This activity can really serve as a starting point for a lot of deeper discussions and activities. For example, talking more about seasonal food, local food and nutrition, the Pilgrim’s journey through the lens of food, and the environmental impact of our current food systems, just to name a few. Since Thanksgiving is so close, this can still be done once students return as a reflection of their holiday. Also consider using the structure of this activity to make connections to other historical events or time periods. For example, how does your breakfast compare to that of a child during the Revolutionary War or World War II? Food has played an important role throughout history and is an easy connection for students to make. For Families: Create your menu together as a family. Check out Plimoth Plantation’s recipes and add one to your Thanksgiving spread. Does your meal align with recommended nutritional guidelines? What will future historians learn about our culture by looking at our Thanksgiving meals of today? Activity: How Authentic Is Your Thanksgiving? Objective: Comparing and Contrasting Thanksgiving 1621 & Thanksgiving 2014. After completing this activity, students will be able to understand the differences and similarities between the first Thanksgiving and our modern Thanksgiving. Starting Question: What’s your favorite Thanksgiving dish? Or, how close is your family’s Thanksgiving dinner to the original? Ask students to share out some of the things they’ve written. Compare and contrast. Pass out Thanksgiving 1621 Menu to students. Take a look at this possible menu from the first Thanksgiving. The only written record of this famous meal tells us that the harvest celebration lasted three days and included deer and wildfowl. Beyond that, culinary historians rely on period cookbooks and journals, Native oral histories, paintings from the time, and archaeological evidence. It’s far easier to know what wasn’t on the menu during those three days than what was. Key Question: What’s on your Thanksgiving menu that’s not on the first Thanksgiving menu? Although the food present at the first Thanksgiving is in some ways very different than what we eat now, the tradition of giving thanks continues on. What dishes are you glad made it into our modern Thanksgiving? What dishes are you thankful didn’t make it onto our modern plate? I think your approach to the subject area was well thought out and covered. I personally broached the topic just earlier today with my children. From the same perspective. History is very important as to how it relates to where we are coming from as a people and where we now stand. This ties the past to the present and also links the future. Children will be better able to grasp. When they can tangibly link and co-relate. Previous Previous post: Introducing @ProfessorDixon!